Uyo (Akwa-Ibom) April 11, 2019 (NAN) Stakeholders in the fight for the implementation of Discrimination Against Persons with Disabilities Prohibition Act say they are set to engage other stakeholders on the domestication of the Act. The stakeholders said they would engage NGOs, Ministries, Departments, and Agencies (MDAs) for the domestication of the Act at Federal and State levels. They said this at the 2nd day of a Three-Day Strategic Planning summit on the Implementation of Discrimination Against Persons with Disabilities Prohibition Act stakeholders’ consultative meeting in Uyo, Akwa Ibom on Thursday. 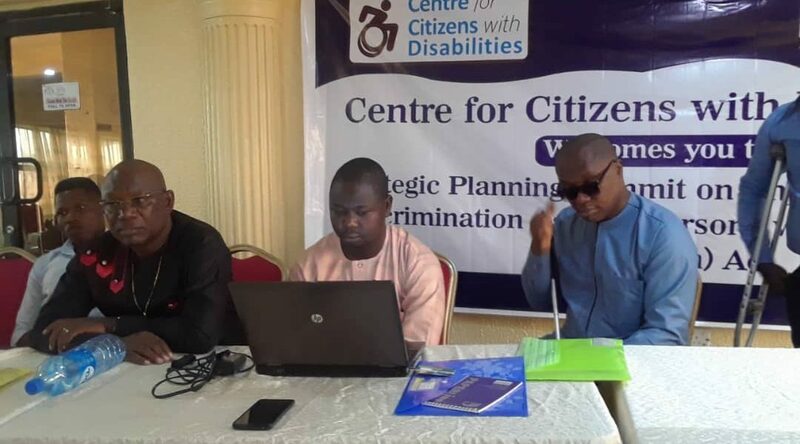 The News Agency of Nigeria (NAN) reports that the summit was organized by the Centre for Citizens with Disabilities (CCD) with the support of Open Society Initiative for West Africa (OSIWA), an NGO. Mr. David Anyaele, Executive Director of CCD, noted that Nigerians along with stakeholders, NGOs, and relevant MDAs had the sole responsibility of pushing for the full implementation of the Act. According to him, non-implementation of the Act signifies that Persons with Disabilities (PWDs) will remain disenfranchised from infrastructure and other basic amenities that can alleviate their plights and sufferings despite the Act. “PWDs will remain vulnerable and limited to all sorts of victimization without proper implementation of the Act at all levels of government. “Effective solutions require strategy formulations, procedures, and structuring to ensure full and active implementation of the law. “Therefore, partnering, collaborating and synergizing with other NGOs and disability stakeholders is the best approach, with the help of governments, donors, disabilities communities, and families of PWDs,’’ Anyaele said. The CCD director noted that the implementation of the Act would also ensure that PWDs were not marginalized in the society. Mr. Lawrence Idemudia, Senior Social Welfare Officer, Ministry of Women Affairs, said that the Act would be implemented if the disability group did not relent in engaging stakeholders through advocacy and campaigns. Mr. Felix Okpara, Director of Rehabilitation, Ministry of Strategy and Social Development, Abia, said that the Act needed not to be over-flogged, as the issues surrounding disability were too huge and numerous to be ignored or waved aside. He advised PWDs not to relent in the struggle to achieve successful implementation of the law, adding that it was for their benefit. Mr. Damilare Atunwa, a Volunteer with CCD said that government, stakeholders, NGOs and Civil Society Organisations (CSOs) must work with traditional and religious leaders for speedy adoption of the law and full implementation. Atunwa, a person with a disability, said that involving such leaders in the implementation would ensure easy elimination of that cultural, language and religious barriers. NAN reports that participants at the meeting include officials of the Lagos State Office of Disability Affairs (LASODA) Officials of Ministry of Women Affairs. Others are officials of Ministry of Strategy and Social Development, Representatives of various disabilities groups, Sign Language Interpreters for the Deaf, as well as other persons with disabilities.